Disney Mickey Boys’ Battery-Powered Ride-On Quad Just $39! Down From $80! Shipped! 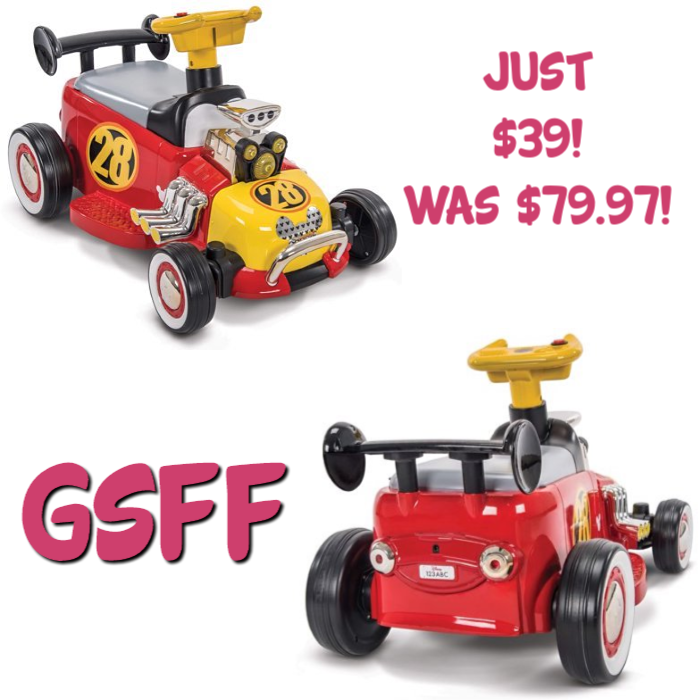 You are here: Home / Great Deals / Disney Mickey Boys’ Battery-Powered Ride-On Quad Just $39! Down From $80! Shipped! Head over to Walmart to score this Disney Mickey Boys’ Battery-Powered Ride-On Quad for just $39.00, down from $79.97 PLUS FREE store pick up or FREE shipping for orders $35 or more! Inspired by its famous driver, this 6V Disney Mickey and the Roadster Racers Battery-Powered Ride-On is ready to get up and hit the track. This Disney Mickey ride-on is one fun ride to the finish line. Easy to operate: Just press the easy-push power button to start the adventure and simply release the button to stop. This easy-to-ride 6V ride-on travels up to 1.5 m.p.h.. It has a realistic-looking chrome exhaust pipes, Mickey-logo shaped headlights and the bold designs of race car number 28, make this ride-on one fantastic design. Comes with a 6V battery and convenient-to-use battery charger. The stable 4-wheel base with foot rests for easy sidewalk use and provides great stability and control.